These simple knit leggings are easy to make. You can sew them on a machine or by hand using a simple backstitch. The ones shown here fit a 1:12 scale tiny ball jointed doll, but you can use the same method to fit any size or shape of doll. To cut out the fabric for your doll leggings you will need to take your basic pants sloper pattern for your particular doll and lay it out on your fabric so that the stretch of the fabric goes across the width of the pattern piece. On this page I show the leggings made with two pieces of fabric, and there will be seams up the inside and outside of the leg. If you are unsure of the stretchiness of your fabric, or if you have a doll with a tiny waist compared to it's hips, this is the best method to use to start. If you prefer leggings with no seam on the outside of the leg, see the next page of these instructions. In either case, the pattern pieces need to be laid out straight so the center of the pattern, lines up with the direction of the knitting. In the photo on this page you can see the basic sloper piece which fits the doll, laying on the fabric so the stretch will be across the leg, instead of up and down. As there needs to be a hem at the waistband, and another at the bottom of the leg to finish the fabric edges, the leg section of the leggings needs to be cut with extra fabric at the top and bottom of the leg as shown. Instead of adding extra fabric for the seams, it is assumed the stretch of the fabric will accomodate at least a 1/8 inch seamline on either side of the legging pieces. If your fabric has more stretch, or less stretch you may have to adapt your fabric pieces. To match patterns like these stripes, once you have one leg section cut, check where the pattern fits at the crotch of the leg and lay out your pattern so the pattern at the crotch sections will match when they are sewn together. If you want to make a pair of doll leggings with no outside leg seam,(the seam can add bulk to the doll outfit), you will need to have a reasonable idea of the stretchiness of your fabric. 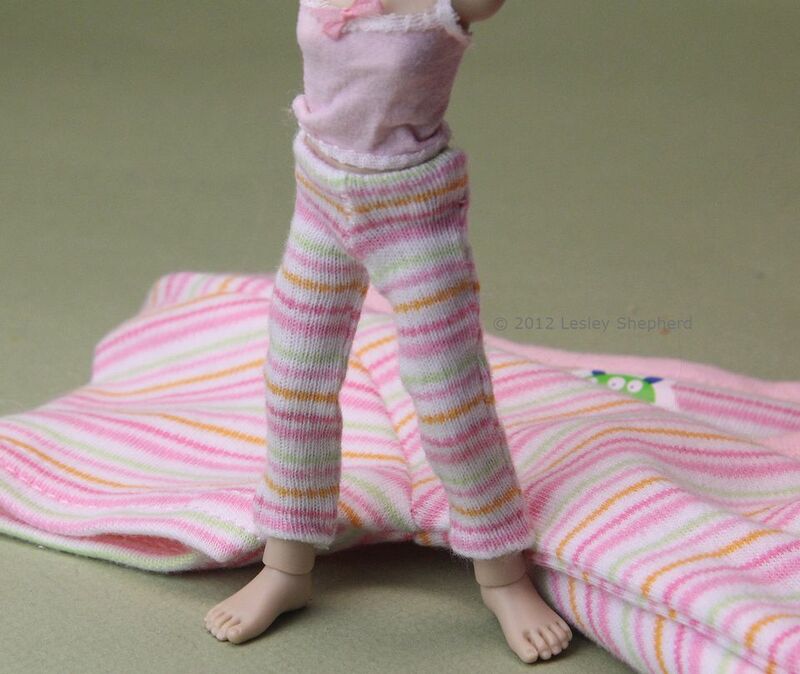 The pants sloper for your doll has been designed with no seam allowance. For stretch fabrics you will need to make this pattern even narrower, as the fabric should be tighter fitting than a normal pair of woven pants. To make a one piece leg for leggings, overlap the outside seams of your pants sloper to make the leggings narrower by the amount of stretch you expect to take up in the fabric. For my leggings I overlapped the patterns by 1/8 inch, pinned them together, then laid them out on the fabric as shown, following the same principles as outlined in the previous step (stretch across the leg of the pant, center line down the straight knit of the fabric, pattern matching at the crotch). To make up the leggings with no outside seam, follow the instructions for the regular leggings, just folding along the center of the fabric piece instead of stitching that as an outside seam. For leggings made this way you will only need one left and one right leg piece as shown in the photo on this page. When you have cut either two or four sections for your doll leggings (depending on whether you want an outside leg seam or not), lay out the pieces to check you have an even amount of hemming allowance on all pieces at the top and the bottom, and that the fabric pattern will work for your leggings, and meet evenly across all sections. When you are sure this is correct, proceed to sewing the leggings. When you have all the pieces of your fabric cut, treat the edges with pva glue or Fray Check to make sure the edges won't unravel. For tiny doll clothing made from fine knits, it is a good idea to test your sewing machine to see which method works best for you. Take a scrap of your fabric, double it so there are two cut edges together, and test sew it on your sewing machine, checking the tension, and the effect your choice of a straight, zig-zag stitch or overstitch will have on the visibility of your seams. In the photo above I want to make very narrow seams for my 1:12 scale doll, so I laid the fabric pieces on a piece of printer paper (you can also use plain tissue paper) to hold the seams and keep them from jamming in the throat of my sewing machine. I stitched both zig-zag stitches over the edge of the seam, and straight seams to see how my machine handles this fine fabric with very narrow (less than 1/8 inch seams). When you sew over paper to work with tiny seams on knit fabrics, you can affect the tension of your sewing stitches. To adjust for this, tear the paper away from your test strip used in the previous strip, and open the seam. If your tension is too tight, the seam may show puckering. If the tension is too loose, your seam may not be closely held together. Adjust the tension on your machine to allow for both the knit and the paper you use to stabilize it while you sew. With the "right" sides of your front and back legging pieces together, lay your legging pieces so the crotch seams match and sew a narrow seam (roughly 1/8 inch) on either side of the leggings from the bottom of the crotch opening to the base of the leg, and from the top of the outside of the legging to the base (see photo) , joining the front piece to the back. You can do this by handstitching using a backstitch or with a machine. If you are sewing leggings with no outside leg seam, fold the fabric so the crotch sections line up and sew from the bottom of the crotch down to the bottom of the leg, keeping the crotch section open. Keep the leg section wrong side out so you can see the seam lines, and test fit the leg section on the doll. You should be able to see if the legging is too tight, or too loose, and also check that the crotch and all fabric patterns fit the doll correctly. If you don't need to make any adjustments, sew the second leg the same way, making sure it will be the reverse of your first leg (so the fronts and backs will line up when you go to sew the crotch seam). If you need to make the leg narrower, sew a second seam just inside the first, to make the leg fit tighter. You can trim away the old seam and the excess material, once you have a leg that fits correctly. To sew the crotch seam to join the doll legging sections together, you will need to turn one leg right side out, with the seam on the inside. Take this leg and slide it down inside the legging with the seams on the outside as shown in the photo, matching the edges of the crotch seam together. To stabilize the crotch seam to finish sewing the doll leggings, match the crotch seam edges at the top of the legs, and pin them to a section of paper as shown. Pin across both legs (one is inside the other) where the bottom of the crotch seam will be. Stitch down the left side and right side of the leggings as shown, making a narrow seam for the front and back crotch. Stop stitching where you would be going through four, instead of two layers of material. (Where the seam reaches the pin at the bottom of the crotch section. Tear the paper away from either the front or back crotch seam you have finished sewing, and remove the pin holding the leggings at the base of the crotch. Spread out this section on your paper and sew the seam around the join at the top of the leg, from the front to the back of the crotch. Remove the leggings from the paper. Turn your leggings right side out so the seams are on the inside and carefully test fit them to your doll as shown. If you are satisfied with the fit, use a pencil to carefully mark the hem length for the bottom of the legs and the top of the waist. Remove the leggings from the doll and turn the hem for the waist to the inside of the waistband. Use a simple hand overcast / hemming stitch to catch the raw edge of the waistband to the inside of the leggings. As the fabric is very stretchy you shouldn't need to add elastic to the doll waistband. Turn the leg hems to the inside of the legs and hem the bottom edge of each leg. If you prefer, you can use iron on hemming tape to catch the hems on the base of the leg. For the waist, which needs to stretch, hand stitching is best. Have fun making a range of leggings from different fabrics to suit the season and your doll's outfits.